This website provides information about over 3000 eBird “hotspots” in Ohio. 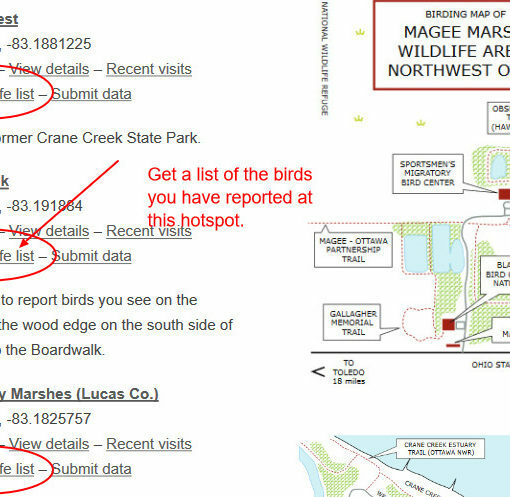 These hotspots are locations to which birders may submit checklists of birds seen. The hotspots are organized by county. When you know the county in which a hotspot is located, you can click on a county name, either in the list of counties or on the clickable map, to see all the hotspots in that county. On each county page, there is a list of all the hotspots in the county, the “top” (up to 10) hotspots which have over 100 bird species reported, and links to birding drives and the Audubon Important Bird Areas in the county. Finding a hotspot when you do not know the county. When you don’t know the county where a hotspot is located, you have three ways to find it. 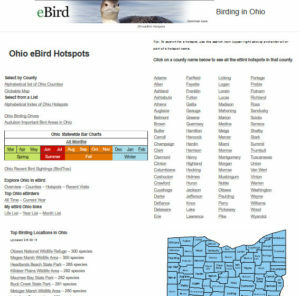 + Look on the home page for the list of the 35 hotspots in Ohio with the most birds reported. Scroll down on the page to that list to see if the hotspot you want is on the list. + Search for a hotspot by using the search icon in the upper right corner of the home page. The icon opens a new page where you can type all or part of a hotspot name and touch enter. You will see a list of all the pages on the website that have information about the hotspot in which you are interested. + Click on “Index” in the main menu on the topbar to go to the list of all the hotspot pages in alphabetical order. Use the A-Z index links or your web browser search function to search through the alphabetical list. On the home page, use the links that take you to the eBird website. The links in the Bar Chart table open lists of all the birds reported in Ohio for the whole year, month, or season of your interest. The link to recent sightings takes you down on the home page to the BirdTrax gadget that shows rare bird sightings reported in Ohio in the last week. The links exploring Ohio in eBird opens an overview of birds recently reported in the state, a list of all the counties, the top hotspots, and a summary of recent checklists submitted. If you are interested in the top 100 birders in Ohio, select the link for all time or the current year to see the top birders in the state. There are links from which you can retrieve your Ohio life list, current year list, and current month list. You must be logged in to your eBird account for this to work.